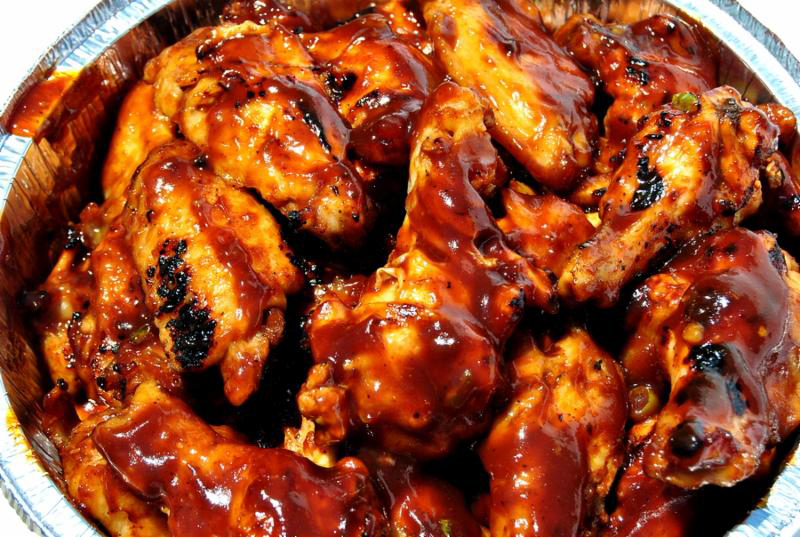 When it’s hot, take the cooking outside and barbecue some easy chicken wings. These tasty bites grill up great in about 20 minutes! After grilling, simply toss in a spicy homemade barbecue sauce. The sauce comes together quickly and can be made the day prior; reheat before tossing with the wings. To make the barbeque sauce, add to a small saucepan the ketchup, 2 tablespoons of water, rice vinegar, soy sauce, chili powder, cumin, and finely chopped onion. Heat over medium heat until the sauce is simmering. Reduce the heat to low and cook for 20 minutes, stirring often. Prepare a barbeque grill with two cooking zones – direct and indirect heat. Place the wings in a bowl. Mix together the salt, pepper, and powdered garlic. Sprinkle over the wings and toss to coat evenly. Put the wings on the indirect side of the grill and cover. Grill to render most of the fat out of the wings and cooked through – about 20-25 minutes or until the internal temperature reaches 165 degrees. When the wings are cooked through, place in a large bowl. Add half the sauce and toss them to coat well. Then place the wings on the hot part of the grill. Cook, uncovered and turning as necessary until the sauce caramelizes and the wings are nicely browned about 3-5 minutes. Toss in the remaining sauce and serve. Makes 6 servings.